For the past four hundred years, Galileo, Siderius nuncius, and Galileo’s subsequent trial at the Inquisition have been used in many contexts to tell many types of stories. With these stories, it becomes increasingly difficult to separate narratives of Galileo himself from narratives surrounding the Galileo mystique. In 1610, Siderius nuncius described the moons of Jupiter and Galileo’s interpretation showed them to be more than just data—it showed the place of the moons among the heavens. John Heilbron’s Galileo shows the interpretation of Galileo, himself, among rich context of Renaissance science and humanism. Few other historical figures can and have so singlehandedly symbolized a quest for truth and championed rationality. Indeed, the story of Galileo and his supposed retort at the end of his Inquisition trial are practically apocryphal in the history of science and long been propped up as a symbol to many who consider themselves martyrs to academic freedom. The quip “Eppur si muove” (“Still it moves!”) simultaneously flaunts an intellectual establishment, a system of cultural mores, and defends the cause of rationality so succinctly that it’s a shame that the story has the misfortune of not being true—rather inconvenient in the face of what the purpose it serves. 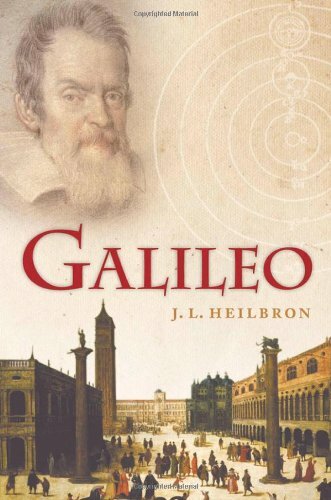 In Galileo, Heilbron contextualizes the life and times of Galileo before and beyond his trial, showing Galileo’s life to be a complex tapestry of Renaissance character—literary critic, poet, musician, and inventor, as well as philosopher and mathematician. Heilbron’s biographic narrative, celebrating the four hundredth-anniversary of Starry Messenger’s publication, provides the cultural and intellectual circumstances necessary to make sense of Galileo’s science, his publications, and his clashes with the Jesuits in 1633. Heilbron shows that Galileo’s support of a Copernican astronomical system is an outgrowth of continuous scientific decisions and his subsequent clashes with the Catholic Church were a long time in the making—not isolated incidents suddenly springing forward fully formed, like Athena from the head of Zeus. Galileo’s story begins well before the publication of Siderius nuncius. Galileo’s childhood in Florence and Galileo’s father’s experiences in the arts and trades provided Galileo with a uniquely pragmatic approach to intellectual matters and the motivation to make explanations clear and understandable. Galileo’s life certainly embodies what many of Galileo’s contemporaries saw as humanist hedonism among a growing scientific and religious intelligentsia. The brilliant contextualizing of Galileo’s life, however, does not uniquely separate Heilbron’s biography from other Galilean tomes surrounding his science and his mystique. Rather, what separates this narrative from others, is the skillful syntax and witty commentary that is so rarely (if ever) present in a serious historical text. Generally, in historiographical and narrative biography, one expects to find a well-researched thesis and practically handcrafted arrangement of events and factoids. One rarely, however, expects to snicker at an author’s asides regarding the success (or not!) of sixteenth-century hair dye or the lengthy non-degree taking status of Giovanni Battista Strozzi and Galileo, himself. Heilbron’s narrative of Galileo assembles Galileo’s history carefully—almost as if building an Aristotelian proof where the historical incidents serve as premises and as the aside or commentary as a conclusion, often highlighting a sense of historical irony. Heilbron’s Puckish narration provides “notes in the margins,” so to speak, of his manuscript. Rather than an unhelpful scholasticism of bias, the asides provide the reader with a welcome sense of context and perspective. The narrative is a serious intellectual endeavor without taking itself too seriously. Not only does the voice and tone of the narrative set Galileo aside as a unique biography within the history of science, it provides a fascinating historical mimicry of the appeal of Galileo’s own writing. Heilbron makes the point that a significant aspect of the appeal of Galileo’s writing—specifically, Dialogue Concerning the Two Chief World Systems—was the voice and vision Galileo employed. The contemporary Renaissance reader had to be fairly obtuse to not understand the significance of comparing the Copernican system with the traditional Ptolemaic one. Arguably, part of the appeal of that was the clear, and often caustic, dialogue Galileo staged between the characters. Casting Simplicio as a very thinly veiled Merry Andrew of Galileo’s own detractors within the scientific intelligentsia and broader culture of the Church was, perhaps, not the most politique of decisions, but it left little room for doubt with his audience. Galileo’s skillful use of rhetoric and dialectic as literary tools insured that the reader came away from his Dialogue with a clear sense of Galileo’s worldview. Similarly, Heilbron’s biography of Galileo employs an analogous use of rhetoric, dialectic, and syntax to showcase historical research. The historical narrative is truly art imitating life—the form, if you will, following the historical function.